PERU IS LIKE A MAGNET, it attracts like-minded adventurers and dreamers. I’ve always been fascinated with how people end up thousand of miles away from the comfort of their homes. Yesterday, during my bone breaking bus ride to Puno, I met with fellow Taiwanese ZhenRui and YanLing. The two honeymooners chose Peru and Bolivia, instead of the usual white beach island destinations, and this made me curious. We spoke about our aspirations and love for travel, and in no time, we arrived wet in Puno. This being the height of a fiesta, there were hot dancing and partying all day and night. The Fiesta de la Candelaria. This festival celebrates Virgin of Candelaria, patron saint, and is held in the first fortnight of February each year. 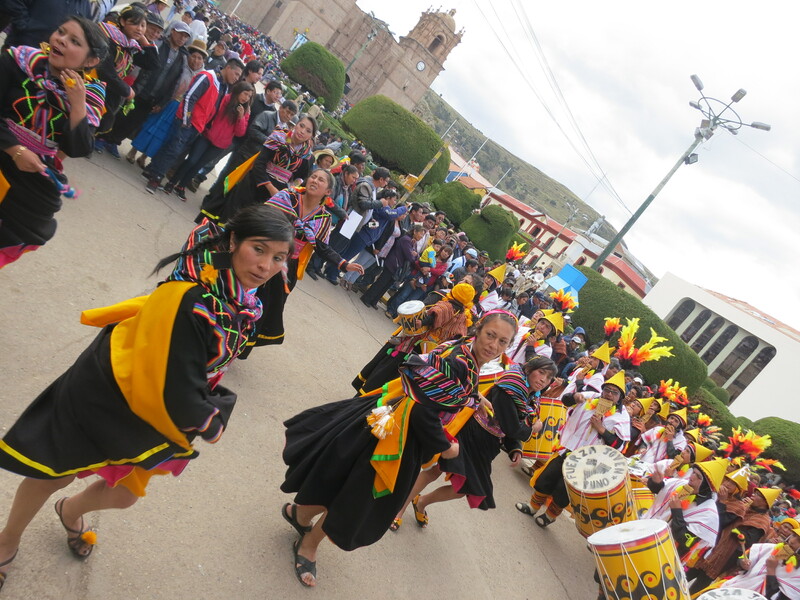 PUNO IS COMMONLY DESCRIBED AS A DUMP, frequently serving as a stopover to either Cusco or Lake Titicaca. However, I find the city quite interesting. Although there’s a lack of good quality tourist attractions, I enjoyed browsing its market and handicraft shops. Big crowds gathered near a plaza, watching people in costumes parade down the street. The attendees were cute toddlers dressed up in their Sunday best, hot sizzling salsa dancers showing off their moves, bands piping their songs, and the occasional men with frightening diablo (the devil) masks. The party has been going on for several days. At first, I wondered how they kept up with their energy, but once I saw the hundreds of beer cans by the trash cans, I realized it doesn’t matter which part of the world we are from, alcohol does miracles. I bought myself a beer or two, but stopped on the third. Booze may be cheap here, I still wish to see the city sober. I enjoyed a quiet and fulfilling dinner at the Loving Hut vegetarian restaurant. The owner, Oscar, was a physician before he ventured into the world of food. The menu was filled with vegetarian versions of various traditional Peruvian delicacies. After just a few bites, I decided that this was the best restaurant I’ve been to in the whole of Peru! I was glad I visited because it was not only delicious, the ingredients were fresh and healthy. I met up with ZhenRui and YanLing again, this time strolling through travel agencies to find a suitable Lake Titicaca tour. I was aiming for a 2 day tour while they were looking for a day tour. We found ourselves a bargain (at least we thought so), and continued to witness the nonstop party on the streets. As much as the music may be addictive, we decided to call it an early night, just so that we can rest well before our separate tours the next day. Healthy adventurers drink in moderation, feed themselves healthy food and go to bed early. There is no use boasting that you can see the world without being safe and healthy. I guess plenty of us adventurers can agree with that.